Choosing harp music adds the perfect touch of ambiance to any event. Harp music will create that special character for weddings, corporate functions, holiday events, dinner parties, grand openings, church services, open houses, and much more. From relaxing background music at a dinner party to an elegant splash at a cocktail party to that extra romantic touch for your wedding, the harp will make your event even more memorable. For over 20 years Robin Purchas has performed professionally with symphones around the world including performances at Carnegie Hall, presidential conventions, and many more. Robin will use her experience to work with you to find your individual needs for your event. This is just a small sample of pieces available for your different events. For background music at special events, a general style may be chosen to suit your needs when booking the event. For weddings, Ms. Purchas will work with you in a private consultation to help you choose the harp music for your special ceremony. Please feel free to call or email if you have any questions or would like to book an event. 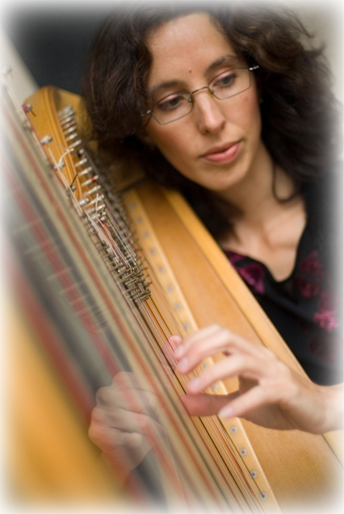 Robin Purchas, a pianist and harpist, studied at Oberlin Conservatory to obtain her Bachelors of Music in Performance and completed her Masters of Music in Performance from Rice University. Ms. Purchas spent extensive time studying with Alice Chalifoux at the Salzedo School for Harp in Camden, ME as well as studying privately with Jean Chalifoux in Alexandria, VA in addition to her university degrees. Originally from Omaha, NE, she has lived in various places around the world performing and teaching harp. Ms. Purchas has played extensive orchestral music with groups such as Omaha Symphony, Houston Symphony, Erie Philharmonic, New Zealand Symphony Orchestra, Christchurch New Zealand Symphony, Dunedin NZ Opera Orchestra, and many more. She has also appeared with popular groups such as Leann Rhimes and Kansas. For over 20 years, Ms. Purchas has also been playing weddings and other special events from private parties to events like a political convention party for Bill Clinton.